Heh, just realized that I forgot to write up a big deal of 2017 post. So, what then the following remark from linguistic supplement to Damgaard et al 2018 means: "The EHG ancestry detected in individuals associated with both Yamnaya (3000–2400 BCE) and the Maykop culture (3700–3000 BCE) (in prep.) is absent from our Anatolian specimens, suggesting that neither archaeological horizon constitutes a suitable candidate for a “homeland” or “stepping stone” for the origin or spread of Anatolian Indo-European speakers to Anatolia."? Yamnaya and some (maybe most?) Maykop samples share the EHG component, but this doesn't mean they're related, certainly not within any reasonable time frame. As for steppe ancestry in Bronze Age Anatolia, I'm pretty sure that at least two of the Anatolia_MLBA samples from Damgaard et al. do have it, and I'm also certain that when many more Bronze Age Anatolians are sampled some of them will clearly show steppe ancestry. I eagerly await dense Anatolian and SE European samples. I'm getting Urheimat fatigue. Let's wrap this up and move on to more fascinating questions! Anatolian languages are the final frontier for anyone looking to dispute the PC Steppe Urheimat. So let's get something definitive from the area. Problem is: IE expansion in Anatolia is correlated to Hittite kingdom. There is no doubt among hittitologists that Hittite language was an administrative language adopted by people without any Hittite ancestry. Same story as Latin in Western Europe. By the way, nobody is defending a diffusion from Maykop to Anatolia, for obvious reasons (IE were in Western Anatolia, and Esstern Anatolia was dominated by non IE). 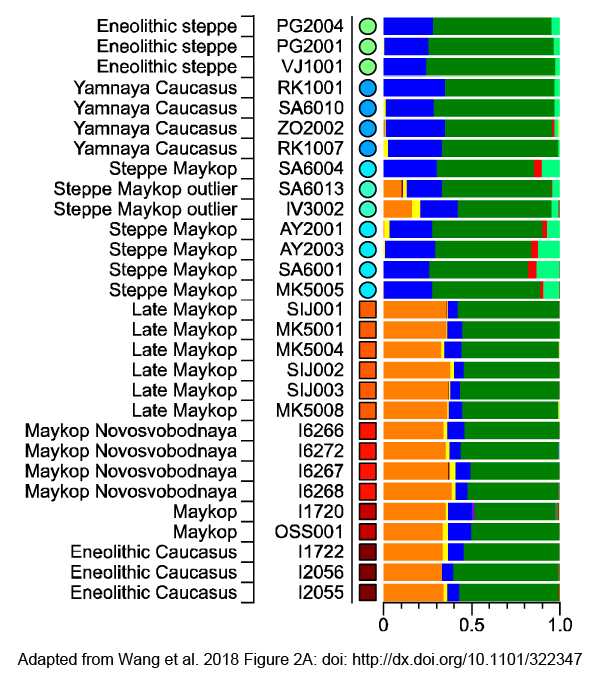 And another point must be taken into consideration: the CHG-like admixture found in Maykop and Yamnaya is not the same (and both probably different from the one found in Anatolia). So, in any case, we don't have any sign of admixture from the South which could explain demic diffusion of PIE. This is very problematic for a South of Caucasus Urheimat. On the other hand, it is easy to a low level of EHG in Anatolia, as it is postulated that only small bands of IE moved in Anatolia during the IIId millenium. What is it, five guys from diverse Hattusa lack Steppe ancestry...? pssspp hahahahahaha. Hardly anything for Damgaard to hang their hat on. Big deal from 2018? Facts are slapping new archaeology across the face on an almost daily basis. Clearly the urheimat is north of yamnaya territory. Khvalinsk or sredny stog? I'd say that the runner up for big deal of 2018 would have to be the Iberomaurusian discovery. Sure it may not contribute much to modern populations' genetics, but it's still a rather unique lineage that whose discovery came as an interesting surprise. Some more fascinating stuff -- and it does relate to the present topic -- is what the hell was going on between CHG / EHG / ANE way back in the day? In the recent Siberia paper (Sikora et al) one model shows a 12% input into proto-Malta from something on the branch towards CHG, but *before* a Basal input into CHG proper. I don't even know if we can call this something CHG-related. In the same model EHG = 76% (78% Malta-like + 22% CHG-like) + 24% (WHG). RE: PIE. 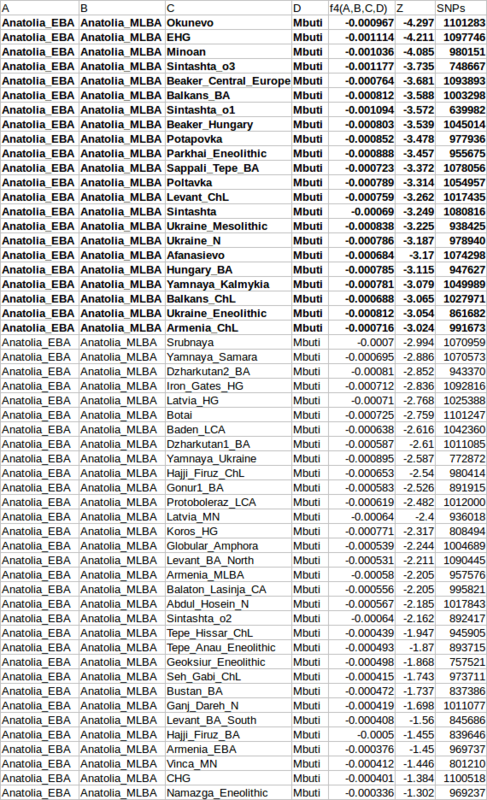 I just don't see any Steppe in the current Anatolian samples. Sure, let's wait for more. But what is the exact route and archeological evidence people are proposing that works with the early branching date? Mathieson (2017) makes a pretty good case against the Balkan route (again, based on the currently available samples). Generally it just doesn't make sense. It's Chinatown. Is Sidelkino closer to Yamnaya than Yamnaya is to Mesolithic Ukraine ? Alex, totally. Iberomaurusian results are fascinating. One the most interesting things for me is it shows us that the basal U subclade unique to Africa, mHG U6, derives from Iberomaurusian. Also, Northwest Africans appear to have a decent chunk of Iberomaurusian. They get 26% in G25. As you said in the post, not really a big surprise to people paying attention, but the data is very solid and should eliminate most of the rambling. Unfortunately, I've got a feeling that we'll be hearing more about Yamnaya being derived from Maykop in spite of all the solid data, and not just from the various wackos stalking this blog. I don't find Mathieson 2017's case against the Balkan route to be all that convincing. They set an arbitrarily high standard by saying only a "high level" of steppe ancestry in Chalcolithic Balkans will support the Balkan theory and fail to find this. 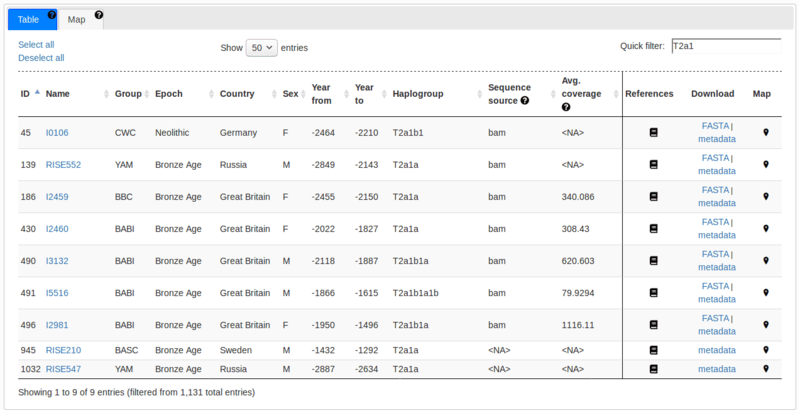 What they do find however, is significant amounts of steppe ancestry even in the handful of samples they present, e.g. the Varna outlier. The fact that there's an outlier even suggests recent migrations from the steppe rather than a long term diffusion. I actually think the lack of substantial steppe in the BA Anatolians is a bigger issue for the Steppe theory, but not by any means insurmountable. I don't find Mathieson 2017's case against the Balkan route to be all that convincing. They set an arbitrarily high standard by saying only a "high level" of steppe ancestry in Chalcolithic Balkans will support the Balkan theory and fail to find this. Yeah, that was my impression. Very strange. "But what is the exact route and archeological evidence people are proposing that works with the early branching date?" Maybe the Black Sea peoples had boats? That's not exactly what they argue. Their reasoning isn't so much that there isn't enough steppe in the Balkan samples, but that the current Anatolian samples are lacking steppe and Balkan-related extra WHG. So yeah, it does all seem to hinge on finding the right people at the right time in Anatolia. 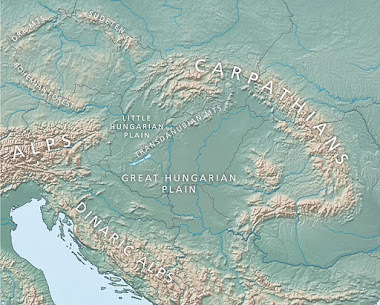 One version of the steppe hypothesis of Indo-European language origins suggests that Proto-Indo-European languages developed north of the Black and Caspian seas, and that the earliest-known diverging branch, the Anatolian branch, was spread into Asia Minor by the movements of steppe peoples through the Balkan Peninsula during the Copper Age at around 4000 bc. If this were correct, then one way to detect evidence of the spread of Indo-European languages would be the appearance of large amounts of steppe-related ancestry first in the Balkan Peninsula, and later in Anatolia. However, our data provide no evidence for this scenario. Although we find sporadic steppe-related ancestry in Balkan Copper and Bronze Age individuals, this ancestry is rare until the late Bronze Age. Furthermore, although Bronze Age Anatolian individuals have CHG-related ancestry, they do not have the EHG-related ancestry characteristic of all steppe populations sampled to date, or the WHG-related ancestry that is ubiquitous in Neolithic southeastern Europe. To be clear I don't have a strong opinion about any of this. It's obviously just an interesting puzzle that a lot of us would like to figure out. Why not release the raw data files without any frills. Or show peer review questions and include names[more transparent]some might be wackos some not? At least one could see why the process to release data takes so long. Richard Smith has some valid points. Part of the argument by Mathieson et al. is that they couldn't find "large amounts" of steppe-related ancestry in the Copper Age Balkans. But there's no need for that if the proto-Anatolians zipped through the Balkans on their way to Anatolia. In fact, I think that the "sporadic steppe-related ancestry" that was admittedly found by Mathieson et al. in the Copper Age Balkans seems just about right for that scenario to appear correct. And in regards to "large amounts" of steppe-related ancestry being necessary in Bronze Age Anatolia, well, they didn't really test that because they only had three Anatolian samples apparently from jar burials, which are a Near Eastern burial tradition. However, the most widely accepted version of the steppe hypothesis doesn't actually posit that there were large waves of migrations from the steppes into Anatolia. Rather, the idea is generally that small bands of Anatolian speakers moved to Anatolia, mixed with the indigenous peoples there, and only then their languages made an impact in the region. Now, this might seem like a fail safe design feature contrived to ensure that the steppe hypothesis is always going to work no matter if there is any steppe-related ancestry found in Bronze Age Anatolia or not, but nevertheless, that is the hypothesis, and it was devised before anyone knew that it would ever be possible to extract ancient DNA from Bronze Age Anatolians. So I don't know what Mathieson et al. were testing exactly, but it to me it doesn't look like they were testing this version of the said hypothesis. The only way to corroborate or contradict the real steppe hypothesis in this context is with fairly dense sampling of remains from the Copper Age Balkans and Bronze Age Anatolia. This hasn't happened yet. "Mathieson (2017) makes a pretty good case against the Balkan route (again, based on the currently available samples)." Mathieson is actually delivering proof of the theory put forward that the Suvorovo culture, a clearly invasive kurgan culture with very clear ties to the steppe (crouched burial, ochre, horse headed scepters), was the vector that brought IE to anatolia. Everybody states there were two Chalcolithic outliers in that paper without trying to think what they were. The Varna culture is the immediate predecessor to Suvorovo so a female outliers in a Varna grave could be the first contact. The other one (male, R1) was found in Smyadova, contemporaneous to Suvorovo and less than 100 km west of it. Those two samples get meaningful once you see its spacial and temporal characteristics. Early bronze age all had a steppe admixture. It's all there, in Mathiesons S.E. Europe paper. There are non-elite IE names in North Syria (Armi) in 2500 BC. Is it just me, or did anyone else find it really weird that the fact that Yamnaya wasn't related to Maykop wasn't even mentioned in the conclusion of Wang et al.? Just noticed the Anglo Saxon, early Medieval Bavarian, Lombard genomes share lots of drift with each other in G25 PCA. So, I guess G25 picks up Germanic drift. I'm going to investigate modern Germans. Dutch look pure Germanic. Dutch score 77% ancient German, 23% French (17% main cluster, 5% French in Lombard burial). Belgian score 60% French (44% main cluster, 16% French in Lombard burial). 40% ancient German. Most German samples score ~33% Early Slav from Avar burial in Hungary. A large subset scores 70% ancient German (+30% early Slav) but none others score over 50% ancient German. Have you actually read the supplement of Guus Kroonen? I don't think so. It by no means postulates evidence of Anatolians in North-Syria. "Regardless of their exact linguistic background, however, the implications held by the presence of individuals with identifiable Anatolian Indo-European names in Southern Turkey at this early point in history for the development of Indo-European languages and the Anatolian split are significant." He basically makes the point that Anatolian wasn't spread by Yamnaya, but derived from an earlier split. North Syria is only mentioned because that's where the cuneiform tablets that mention Amri were found. Well, actually the "Anatolian names" are from Armi and that often is related to Jarablus, North Syria. However, the point I try to make is that Kroonen doesn't propose a North Syrian Anatolian population and he makes that very clear. There are only 20 possible Anatolian names among a multitude of Semitic names in the tablets. Is that Ancient German basically Bell Beaker ? Those of you who still believe that there's no steppe ancestry in the Hittite-era samples, check out how coherent these stats are. They're not just random inflated Z scores this way or that due to ancient DNA damage or whatever; there's actually a clear pattern here. Do you have an idea where from Germany the Germans you test came from? East-Germans are different from North-West Germans and South-Germans. I'd say Lower Saxony and Nordrhein-Westfalen should be more or less like Dutch. "I'm going to investigate modern Germans. Dutch look pure Germanic." The majority of the Dutch samples clusters with the British. Modern Germans are not very helpful as a reference population, because they are very heterogeneous. Some are attracted by the French, others are attracted by the Swedish and again others are attracted by the Slavs. A large part of the German samples is rejected by nMonte and only the French-attracted Germans are kept. Because there are so many German samples to start with, these French-attracted Germans may still outnumber the British samples, especially if you didn't include the Irish in the model. But if you run an appropriate unsupervised clustering, you will find that most of the Dutch samples will cluster with the British. How much (as a percentage) and how does it compare to Mycenaeans? In any case, the series of D-stats I posted above shows that steppe admixture was in Hittite-era Anatolians, otherwise we're looking at a coincidence, and D-stats don't mean sh*t in that case. The fact that steppe admixture was present in Hittite Anatolia means it's game over. The amount is irrelevant. The ancient German references are...Lombards (over a dozen samples), Early Medieval Bavrians (over a dozen samples), and a single Anglo Saxon genome. I don't know where in Germany any of the modern German samples come from. The ancient Germans are very similar to each other. This probably means David's G25 PCA picks up Germanic-specific drift similar to how it picks up Iberian Neolithic drift, Balto-Slavic drift. "But if you run an appropriate unsupervised clustering, you will find that most of the Dutch samples will cluster with the British." I was just having fun. I doubt many Germans have 30%+ Slavic ancestry. We don't even know where my Slavic reference, early Slav in Hungary (who clusters with Polish), comes from. She might have Germanic ancestry. If Dutch cluster close to British/Irish, then ancient Germans should as well because Dutch are very similar to them. I recall, in K36 a handful of Alemani samples all clustered closest to Dutch. In G25, three other early historical Germanic pops also cluster close to them. "Is that Ancient German basically Bell Beaker ?" If Ancient German is basicly Bell Beaker, what is Hallstatt Celts then? During the Iron Age there is 2 types of people in what is now Germany: The "Ancient Germans" (Germanic people) in the north and the Hallstatt Celts in the South. We know these 2 groups had been at war. (So called Germanic-Celtic wars). Generally its said the Celts had been technological superior (Weapons, armor, fortifications, everything better) but the Germanic people apear to have won these wars. Its also said, the Germanic peoples apear to have adapted more and more Celtic things. Weapons and the style of clothing. Sometimes it was claimed, the Celts just staid and became Germanic or admixed between both. Traditional idea about "Germanic people" is: Scandinavians, invading Germany. But, less widespread known, at least one of the "western Germanic" tribes aswell. The Saxons claim to have been migrated from Norway to Germany aaaaaand, the Saxons have a claim about the Franks. While the Franks claim, that they are the last survivors of the City of Troy (ROFL), the Saxons claim, the Franks and Saxons migrated together from Norway to Germany. These "ancient Germans" DNA set is, as far as I remember several members of the "Bajuwarian" tribe (the tribe Bavaria is named after). Suposedly they are very different from modern Bavarians. One if these differences is the pigmentation. These Bajuwarii had been so fair haired, that the scientists claimed, they would have never expected to see something like that outside of Sweden. A population near the Alps shouldnt be like that. Davids PCA showed, there is a clear difference between Ancient Germans and Hallstatt Celts. As far as I recall, the Celts are usualy claimed to be the ones, closer to German Bellbeaker than the ancient Germans are. The names found in relation to Armi are postulated by Kroonen to be from a specific unknown language from the Anatolian branch. Problem us the corpus is extremely limited. He used 19 names, but some seem bases on the dame radicals, and could variations of the same names, perhaps from the individuals. In fact, I found less that 10 different names. Some are looking very similar to local semitics names. Others have only one occurence. And even of some could be seen as Anatolian, it does not mean IE. First Hittites names are not easily translated in IE radicals. In any case, it only means that sole IE could have been present in South Anatolia or Northern Syria around 2500 BC. No but deal here, it is postulated that IE came un Anatolian during the IIId millenium. So nothing new here. The main point of Kroonen is more about the source of the Anatolian IE as a different population than Yamanaya. But he is wrong about Yamanaya chronology, and he doesn't take into consideration that Yamnaya were already present in Thrace in the late IVth millenium. Mathieson is making a good case against a theory (very popular in some circles) postulating an early entry in Anatolia in the IVth millenium with a wide diffusion of IE languages. The fact that we know that a large part of Anatolia was non IE has always been a serious difficulty for them. Most hittitologists have always postulated a latter entry, during the IIId millenium, with limited demographic impact. Just a reminder to everyone: Anatolia during the IIId millenium was a commercial crossroad between Balkans and Mesopotamia. It is meaning that various ethnical groups can be found among those roads. There is no reason to think that merchants from the Balkans could not be found in Northern Syria or Mesopotamia. We already know that the reverse is true. Yes, Wang et Alia conclusion is extremely surprising. It goes in contradiction with their results. Moreover, they have made a single cluster (Steppe cluster) with all their Steppe related samples, including their Maykop Steppe samples. 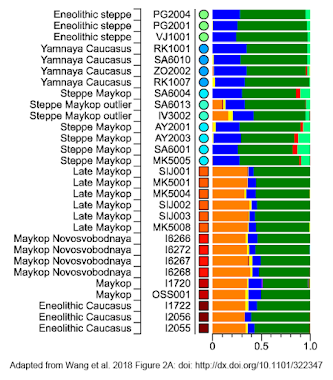 Problem is that it changes their results about Mt haplogroups, as Steppe Maykop have some Southern admixture. If you are excluding those samples, the divergence between the Caucasus Cluster and Steppe individuals is far greater. And their "limited contribution" is even more difficult to defend. Hittite-era samples are no more "steppe" than EBA. In-fact, they can be modeled as less "steppe" than EBA. It would make more sense to use Armenia EBA, instead of some SW Iranian pop and a steppe group. And on top of that we have mt-hg H6a1b in Anatolia_MLBA. It's pretty clear what's going on: gene flows from various directions are confounding the models, and masking the steppe ancestry (if you want it masked that is). Single D-stats aren't more reliable than qpAdm or qpGraph. Too many other factors can affect that. More proximate populations, such as Armenia EBA cover the EHG stuff. There is no need for any steppe ancestry. There's no R1b either. Anyway, getting back to the main topic. Back in 2016, using low res mtDNA data, I worked out that Yamnaya had European farmer ancestry and that the relationship between Yamnaya and Iran_Neolithic was very old, not recent, and probably dating to the Mesolithic. I'm comparing directly pre-Hittite and Hittite era populations from the same region of Anatolia, one that came straight after the other, and I'm getting sigma 2+ mostly with references from the steppe and the Balkans. References from the Caucasus and Iran are way down the list. This all looks very systematic and not at all like a coincidence. It's huge in the context of the steppe hypothesis. It corroborates it, because it shows gene flow from the steppe via the Balkans into Hittite Anatolia. I'll get back to you on Normandy, France, Germany genetics soon. No serious study has been done on Germany. 23andme does an ok job picking up "German & French" (they should very different) ancestry. It makes it impossible for mixed European Americans to model their ancestry because we because we don't know if we had French-admixed, Polish-admixed, Dutch-like German ancestors. I've always been a little skeptical of the Hittites-through-the Balkans idea, seemed kind of ad-hoc, but Davidski's case is looking more and more convincing. I don't mean to step on Grey's toes here, but if I can speculate idly here for a moment, it makes one wonder about that double-headed eagle symbolism that's common to both the Hittites and the Illyrians. Yeah, it's found elsewhere, too, for a variety of reasons, but still. This doesn't seem logical to me. If these people have Anatolian names and are not Indo-Europeans, who are they? Doesnt look like Yamnaya is derived from Maykop, or the Vice Versa. BUT, it looks to me they both derive significantly from a common source. The dark green component in the ADMIXTURE run is huge in both of them. Davidski, why is basically the same EHG D-stat totally different in Damgaard et al? Are you using just the sample that seems like it has the most steppe? Chad's qpAdm runs make sense and are more consistent with published work and what people (including me) have seen with G25/nMonte. Anyways, let's assume there's more steppe in Anatolia_MLBA than EBA. I don't really understand what this would prove language-wise considering the early Anatolian branching. There'd need to be *much* earlier steppe-derived movements into Anatolia, or, alternatively, proto-Anatolian would have to be shown to develop elsewhere, unrelated to Yamnaya, and exist in isolation for over a millennium before arriving in Anatolia. Further, traces of the earlier Anatolian-related IE languages that purportedly existed in the Balkans and previously on the steppe would have to be steamrolled later on. All plausible of course, but I definitely wouldn't say 'game over' in the same way we can with IE in northern Europe and south Asia. Generally it doesn't make much sense focussing on MLBA / Hittites considering the evidence of earlier IE presence in Anatolia (aforementioned Ebla records), as well as the possibility that Anatolia_Chl might already have some real (though minor) EHG at 4000 BC, which I believe I was the first to suggest when the genome was released 2+ years ago. Am I missing something? Why would Maykop being unrelated to Yamnaya be news? There's a steppe-admixed sample at Kumtepe (maybe Kumtepe 4, memory isn't very reliable for me), in Turkish Thrace. About the big deals of 2018, it can be said that the Iberomaurusian, Dzudzuana and Yana papers are contenders for the second place (as they help us understand the past). Interesting that the Dzudzuana paper's model of ANE and the Yana paper's model of Yana are similar (both featuring them as West Eurasian-ENA mixtures, with the latter between 20% and 30% and being closest to Tianyuan and generally East Asians, and the former as closest to Kostenki and Sunghir, though not them directly, having split from them circa 38 kya, per the Yana paper). Neverthless, I think the best option would be staying close to the post's topic. To be sure, Yamnaya does show a close genome-wide genetic relationship with an earlier group from the North Caucasus region: the so called Eneolithic steppe people. But they can't be linked to Maykop or even the roughly contemporaneous nearby Eneolithic Caucasus population, and seem to have vanished, at least as a coherent genetic unit, just as Maykop got going. 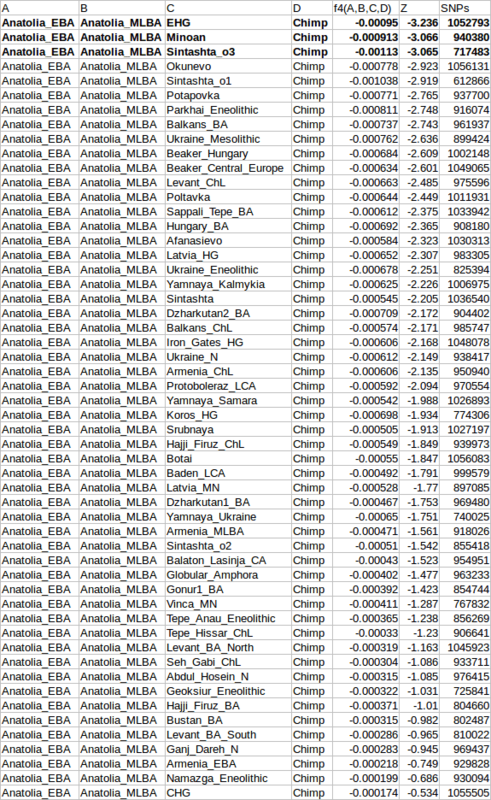 I'm using all of the available Anatolia_MLBA samples and all of the available EHG samples, and Chimp as the outgroup, which I find produces more robust results with ancient DNA than Mbuti. Damgaard et al. ran this stat D(EHG, Mbuti;Anatolia_EBA, Anatolia_MLBA), and got a Z score of 1.83. I don't know which samples they used exactly, probably not the same ones as me. They used Mbuti as the outgroup. But I'm not concerned about their result, because my result makes sense in the context of a whole series of results. Chad's models are based on certain assumptions that may or may not be true, and include samples that may or may not be relevant, while my series of D-stats is a simple, direct comparison of pre-Hittite and Hittite era Central Anatolians, with the only assumption being that Anatolia_EBA was the type of population that existed in Central Anatolia before Anatolia_MLBA. Now, this one assumption may or may not be true as well, but it's much less of a stretch than assuming things like the migration of Armenia_EBA to Central Anatolia. It does make sense to compare pre-Hittite samples with Hittite era samples. No one really knows how and precisely when Anatolian languages spread around Anatolia, but we do know at least that they were spoken in Hittite era Central Anatolia. Because in recent years it was widely but wrongly assumed that the spread of CHG/Iran_N ancestry into the steppes was due to Eneolithic/Bronze Age population movements from the southern Caucasus and Iran, and that Maykop was involved in this process. In fact, I'd say that years ago many people from places like Max Planck and Broad MIT/Harvard already basically made up their minds that this was the best way to explain the diffusion of Indo-European languages into Europe. I think that these people are still trying to cope with what their own data have revealed. It'll be interesting to see how they react once everything sinks in properly. Predictions. There's two strains of Greeks. Each strain formed in the Iron age. Aegean Greeks are half Balkan IE (Greek. Mostly EEF, some CHG, signifcant Steppe) and half East Med (Anatolia EBA & Levant BA combo). Mainland Greeks are mostly Balkan IE with significant Slavic admixture. Out of curiosity, how much does using Mbuti outgroup change things? Heh, using the full genome Mbuti sequences actually seems to be increasing the Z scores. Hang on, I'm going to do this properly, and copy a format from one of the Harvard papers that used f4 stats to look at population shifts in ancient Europe. I'll post the results in a new post. Of what samples exactly are those Anatolia_EBA and Anatolia_MLBA composed? They're samples from Central Anatolia from the Damgaard et al. paper. Removing MA2203 from that list, does that change much? Removing MA2203 actually helps things a little, although not significantly, but maybe that's because this sample has more heterogeneous ancestry, with both more basal and more steppe. 1) Any stats go positive? All these tables are negative. 2) What do the ENA / Native American outgroups and Ust Ishim do with this data? Close to neutral or any unusual patterns there (just as a sort of sense check of what is going on). I mean, unless you're obsessive compulsive then that's close enough to sigma 3. This stat isn't driven by any sort of CHG-related input into Hittite era Anatolia. The gene flow was from somewhere else. Obviously you're not very good at this. The green component is very old and doesn't come from the same source in Yamnaya and Maykop. It was already on the steppe during the Mesolithic when Maykop or Iranian farmers didn't yet exist. Quit spamming the comments here with your nonsense. You're banned from this blog. That Hajji Firuz R1b sample is from the Iron Age. You'll see when the paper comes out.